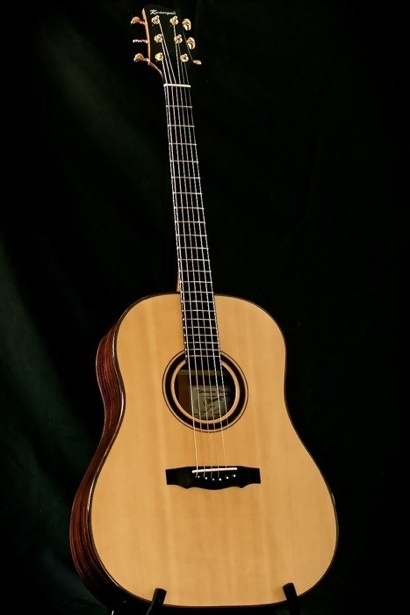 This Kwasnycia guitar is called a K45 and the shape of the guitar comes from a 1954 Gibson J45. The sound hole has been moved and the bracing changed to give the signature sound of the Kwasnycia guitar. 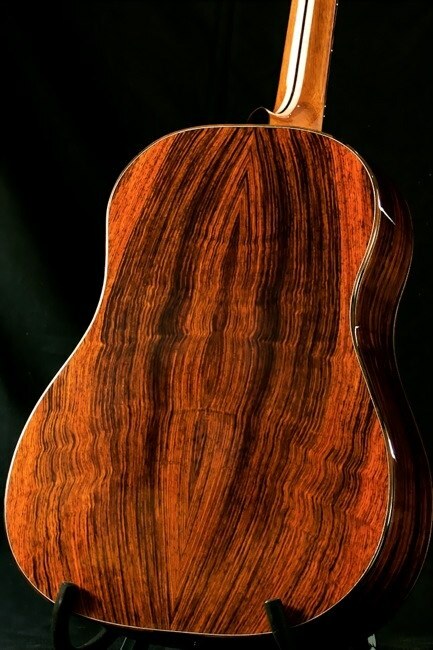 The back and sides on this guitar are made of figured Cocobolo and the top is master grade Sitka spruce. The binding is made of Ziricote and it’s olive green/browns stand in nice contrast to the Cocobolo back and sides. The fingerboard, bridge and headstock overlay are all made of Macassar Ebony and the fret wire is Gold Evo. These frets are hypoallergenic and last longer than standard 18% nickel frets. Not as hard as stainless steel, but found right between the stainless and the nickel frets in hardness. The bracing is fully scalloped and tuned for maximum resonance and tone. Machine heads are Gold Gotoh 510’s with an 18:1 ratio for smooth, easy tuning. The bone saddle is fully compensated and the nut is also bone. Included in price: Free fitted TKL case with arched top and back. Plush crush velvet interior. This page has been kept for comparative and research purposes. She’s a beauty. Enjoy!